If you work with SEO and organic traffic to websites, you need some tools to make your work easier. There are so many tools out there so it is, however, difficult to know which ones are worth it. So is SEO PowerSuite any good and worth the money? This is what I will look into in this article. 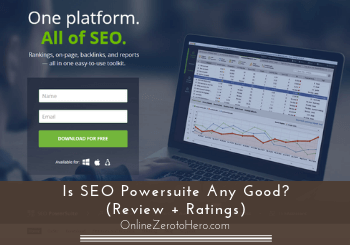 I have worked with SEO for several years myself and tested this tool and will in this 2019 SEO PowerSuite review give you all the details, so you can see if it is the right solution for you or not. I will also show you how you can get an exclusive free trial of the professional version of the software. SEO PowerSuite is a comprehensive all-in-one SEO tool that can help with almost any aspect of SEO work. It takes a little time to get to know all the features and how to use it in details, but overall it is quite intuitive and user-friendly. One of the best aspects of this tool is the VERY good value for money you get compared to similar SEO tools. What is SEO PowerSuite and what does it offer? SEO PowerSuite is what you can call an all-in-one SEO tool, as it gives you access to tools and features that can help you with most SEO tasks. It is used by more than 2 million people worldwide. So let’s start by going over the 4 tools you get access to with the SEO PowerSuite software and what you can use them for, so you can easily see if it offers what you are looking for. Let me just make it clear that this will not be a full tutorial to show you how to use every single aspect of SEO PowerSuite. There is plenty of tutorial like this on SEO PowerSuite’s website. This review is instead to give you an overview of what it offers, what you can use it for, and who it is right for, so you can find out if t is right for you or not. So let’s go over the 4 tools. The rank tracker is, as the name suggests, a tool that makes it possible for you to track rankings. When you have a website and work with content and organic traffic, it is important to have a tool that can help you with this to see what you are doing is working and keep an eye on the progress. What is great about this SEO PowerSuite rank tracking tool is that you can track unlimited keywords and unlimited websites. You can also track in many different search engines, and you check in specific countries. In fact, you can track rankings in over 400 international and local search engines. The rank tracker gives a lot of valuable info about your rankings – for example in different search engines. Being able to get info about rankings from different search engines and from different countries is a feature I think is really cool. It is a great option to have if you have a website with visitors from all over the world. Getting info about the rankings in different countries can help you optimize your site and help you with targeted campaigns. 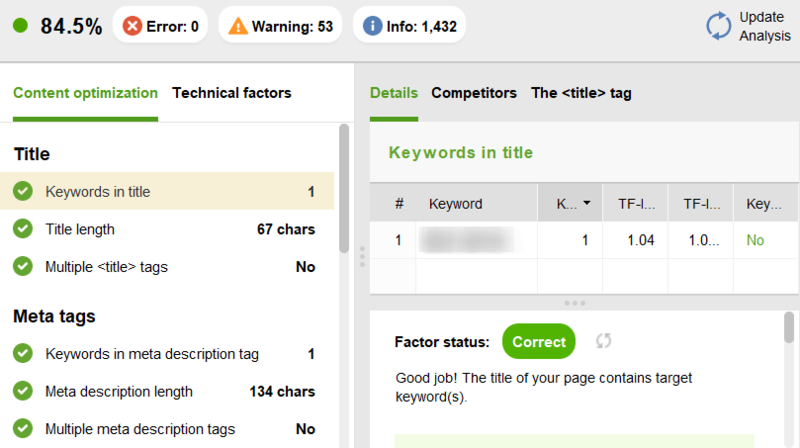 You can also use the rank tracker to monitor your competitors’ rankings and compare them to your own. The rank tracker cannot only be used to track rankings but also to do keyword research. It has quite a lot of keyword research methods/tools integrated. You can use it to generate a lot of keyword ideas from among other tools Adwords, Google Trends, autocomplete tools, YouTube suggestions, and much more. It can almost be a little overwhelming to choose which methods you should use to get keyword ideas. But that means that you can quickly come up with a lot of ideas if you just take the time to get to learn how to use the rank tracker. In my experience, you should however also just be aware you need to prioritize. You can quickly get lost into a rabbit hole and use hours to check out all the options it has. So you just need a little bit of focus. You will also get access to automatic ranking reports. These are a great way to get a good overview. If you work with clients, these reports can, in particular, save you a lot of time, as you can use them to keep your clients updated about the performance of their site and the results of your work. The WebSite Auditor is one of the tools in SEO PowerSuite I find a lot of value in using and it is one of the tools I use the most myself. It is a tool that, for example, can give you an overview of technical SEO issues on your website very quickly. The WebSite Auditor gives an overview of potential technical issues. You can also choose to do an analysis of your content on specific pages/posts. Even though you probably already create great website content, it can be good to test once in a while to see if there should be any issues. 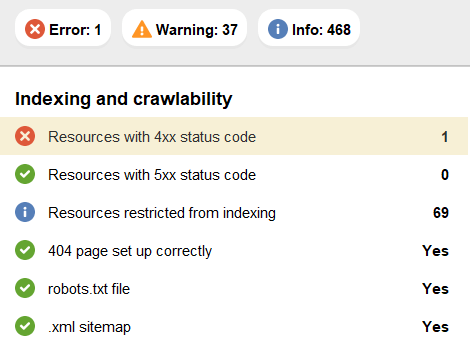 The WebSite Auditor makes it fast to get an overview of potential on-page SEO issues on specific pages/posts. You can also get an on-page audit. This is great for your own websites but I find it extra useful for sites that are not my own. If I am asked to optimize clients’ content, this tool makes it easy to get a quick overview of the pages I need to optimize. The WebSite Auditor also makes it possible to generate reports that give an overview of any issues that need to be dealt with. It gives you an overview of errors, warnings, and more. The report option gives a good overall audit and overview. Some of the errors and warnings might not be something you need to do anything about. But they are things you need to consider and it is a great way to get an overview. The report can also be a good and fast way to create quick preliminary reports for clients to show them the state of their website. Then after you do the work, you can run a report again and show the difference. SEO SpyGlass is SEO PowerSuite’s backlink checker. A great thing about this backlink checker is that it gives you unlimited data. This means you can get data about unlimited websites & campaigns, unlimited backlinks, and unlimited exports. According to their own numbers, it has 1.6 trillion of the freshest backlinks and it crawls 7.1 billion web pages per day, which makes it a very fast way to analyze backlinks. It gives you a lot of details about the backlinks and is a good way to get an overview of your own backlink profile and your competitors. Example of a backlink graph from SEO PowerSuite. Like in all the other SEO PowerSuite tools, you can get reports that give a good overview. You can also get a report that compares the backlink profile for different domains. Overall a very handy and comprehensive tool if you work with link building. LinkAssistant is another link building tool. This tool is for getting ideas for link building opportunities as well as keeping an eye on the links you have already acquired. When looking for link opportunities, you can use 12 different methods to get ideas in LinkAssistant. 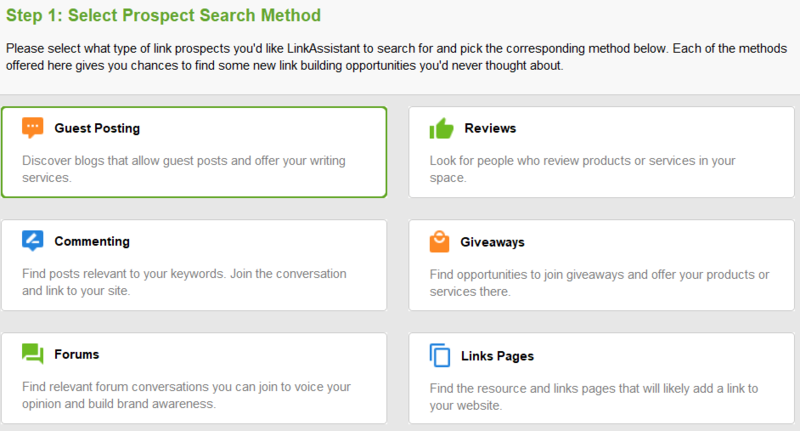 LinkAssistant includes several ways to find link building opportunities. I could not fit all the methods in the image above but it has a total of 12 research methods that will help you quickly get a lot of ideas for link building opportunities. You can search for guest posting, reviews, commenting, giveaways, forums, links pages, links submission forms, directories, topical blogs, competitor backlinks, your backlinks, and do a custom search. One thing that is very handy is that you can do outreach from within the tool itself. You can also find email templates for different types of outreach. This can save a lot of time. If you are going to do outreach, I will, however, say that even though outreach templates are good, you should, in my opinion, make sure to personalize your emails. Only relying on pre-made templates will not make it personal and rarely give as good results. But templates are a great place to start. As with all the other SEO PowerSuite tools, you can get reports that will give you a good overview and that you can use for yourself or for clients. As you can see, SEO PowerSuite is a comprehensive SEO tool and has many features and several tools. This means you can do a lot with it, but it is, of course, also important how easy it then is to use. Overall, I will say that SEO PowerSuite is fairly intuitive and easy to use. With so many tools and features, it will take a little time to get to know all the details for sure. It will, however, not take long to learn to just use the overall tools and the most common features which can do a lot for you. If you want to learn all the details and get the most out of the tools, it will take a little learning – but that goes for any SEO tool. SEO PowerSuite luckily has quite a lot of tutorials and videos on the website that shows you how to use the tool in details. On their blog, they also regularly post articles with great tips about SEO in general and how to use their tools in this connection. So there are quite a lot of resources to learn to use the tool in details. One thing that is not as user-friendly is that when you, for example, run a website audit of a bigger website or use the tools to get keyword suggestions, it can take some time to generate the data. SEO PowerSuite goes through a huge amount of data, and it can therefore sometimes take some time. So in some cases, you should not expect to get access to the data after just a few minutes but have to be a bit more patient. This is not necessarily a problem as long as you are aware and plan accordingly. And it also means you get access to a lot of data. You just need to be aware and take it into consideration. There are several pricing options for SEO PowerSuite depending on your needs and preferences. First of all, you have a free option. This is NOT just a 7-day free trial as many other tools offers. You will actually be able to use the free version continuously. But of course, the free version has limitations. You can for example not save projects, and there is some data you cannot get access to. However, I think it is really great that they offer a free version, and you can actually use it for a lot, and it is amazing a tool like this is really giving you the chance to test it for free before you decide if you want to upgrade or not. So let’s then look at what the price will be if you decide to upgrade SEO PowerSuite to a paid version. SEO PowerSuite has both a Pro and an Enterprise version. As you can see in the image above, you can choose to either get a pro or an enterprise version. It is important to mention that the prices are for lifetime access to the tools and not per month or year or anything else. Below, you can see a table that describes the difference between the professional and the enterprise licenses. The difference between SEO PowerSuite Pro and Enterprise. You can always start with pro and then upgrade to enterprise later if your needs changes. These prices are, as mentioned, a one-time fee and include professional support, feature updates for life, unlimited access to the training material, and 6 months search algo updates. So what you need to know is that after 6 months, the updates for any potential updates in the search engine algorithms will no longer automatically be a part of the tool. There is a fee for these search engine algo updates. You can either pay monthly or pay for several years at the time if you want these search algo updates. Costs for search algo updates after the first 6 months. By paying for longer periods, you can really get a good price. If you pay for 36 months of search algo updates for the pro version, you will for example only pay $4.17 per month. So if you want these updates, it can be worth considering getting them for a longer period. This is the only continuous fee there is by getting SEO PowerSuite. Also, I have been able to get an exclusive invitation link to visitors of my website. This link will give you access to the pro version for 14 days completely for free – something that is NOT offered on SEO PowerSuite’s own website. SEO tools can become very expensive and there are a lot to choose from. SEO PowerSuite offers something quite unique compared to most other SEO tools I have used or heard of. You can actually get access for life for just a one-time fee. Yes, there will be an extra monthly cost if you want the search algo updates. But it is still very cheap. Many similar tools will cost around $99 per month. So even with the search engine algo updates, SEO PowerSuite is very cheap compared to many other tools. In my opinion, it is one of the SEO tools that gives the best value for money. You get access to a lot of great tools for a cheap price compared to other tools. In addition to this, you can actually get to test the tool 100% for free so you can see for yourself what it has to offer before you buy. This is also unusual for a SEO tool with this many features. This does, however, not mean it is a tool for everyone. If you just have a single website yourself and are just starting out, it might be overkill to get SEO PowerSuite. But if you work seriously with for example link building, it can still be a very good tool to get, as it has many options. And even if you just have one or two websites, the tools give you a lot of optimization help that can help you improve your rankings. So overall I would say that SEO PowerSuite is definitely worth the money and gives very good value for money but it, of course, depends on your needs. From this review, you can see that I am pretty positive about SEO PowerSuite. I regularly use it myself both for my own website and for client’s website and it gives some good info I use to improve the search engine rankings. But if it is the right tool for you or not depends a lot on your needs. So let’s sum up the pros and cons, so you can get a better overview. I think SEO PowerSuite has some great tools, and they have helped me optimize several of my own websites as well as client’s websites. Compared to similar tools, it gives very good value for money, and you can get a lot of SEO work done by getting a license for it. If you are new to SEO and do not know much about it yet, then it might, however, be a bit overwhelming with all these tools. But overall, it is, in my opinion definitely a great software and tool. If you want to try SEO PowerSuite, you can download the software for free on the official website. The free version will, however, as already mentioned, have some limitations. I am therefore very happy To be able to offer you an exclusive offer. I have been allowed to give a special SEO PowerSuite offer to you as a visitor on my website – you cannot find this offer on their own website. 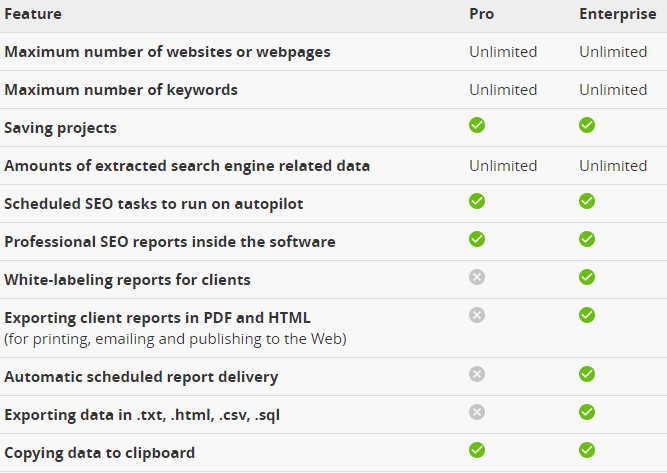 By clicking the button below, you will be able to get an exclusive 14-day free trial of SEO PowerSuite Professional. This means you will get full access to all the features and are able to really test it out. So hope you will enjoy this free offer and use it to find out if this is the right tool for you in the long run or not. If you have any comments, questions, or have any experiences with SEO PowerSuite yourself, I would love to hear from you in a comment below. Thank you for sharing this information with me. The cost of this product looks fairly reasonable for us folk that want to work with SEO on our sites. I found it very handy that you gave me the pros & cons of this product which will no doubt help me make up mind, if I do decide to buy it. I like the fact that this product has great training with it. In the cons of SEO PowerSuite you said it can be overwhelming to use, could you explain a bit more to me what you mean by this? Great Article and review. I have learned something new today. Who knows I could be using this product very soon to make my online working life easier. What I mean about it can be overwhelming is that if you are just starting out and only have a small site, then it might have too many functions for it to be necessary. It takes a little time to get to know the features it has even though it is quite user-friendly. So if you are just starting out online, it might be a bit confusing. But if you have a bit of experience online and a bigger site (or more sites) then it is an amazing tool that can really save a lot of time. SEO power suite looks like an interesting piece of software, I still feel most of the tools are there for free, such as Google Insights, google keywords, Google analytics etc. If you do your own research and create quality content you will automatically start to see improvements. It all takes time, so it doesn’t matter how much you stare at it, it won’t change. Saying that, it is worth getting some basic SEO tools for ease of use, correct structures etc. Thanks for sharing your opinion Kris. I agree that Analytics and Search Console are very important and something everyone with a website should have installed. It is, however, very different info you get from them compared to a tool like SEO PowerSuite. Google’s tools will for example not give you a website audit with a quick overview of potential errors, you cannot use it for backlink analysis, you cannot use it to create reports easily with the same data, and you cannot monitor your rankings in different search engines in different countries, just to mention a few examples. It, of course, all depends on your needs. If you just have one small website for yourself, it will probably be overkill to get a tool like SEO PowerSuite as I have also mentioned in the review. But if you work with several websites or work with clients, it is a tool that can potentially save a lot of time, in my experience. It was very interesting to read your article. I did not know that tools like this existed to help you bring more traffic to your website so I am really grateful for the information that you have shared with us. Glad you found it useful and just ask if you have any questions. I’m a newbie in online business and I have been making researches on the best SEO tool for my site but those I have been coming across, I don’t really understand how they work. This article has really convinced me about powersuite and I think it will really be of good to help to me. The fact that you are using it, that’s a good example to follow. Glad I could help Lok. What is great when you are first starting out is that you can check out SEO PowerSuite for free so you can really get a good sense of what it can do for you before investing any money.